On a recent trip to Hawaii, I had to ask myself, is this really paradise? 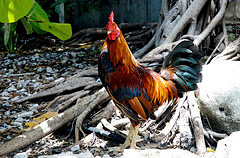 The island of Kauai suffers from a chicken problem, there everywhere. The chickens are the result of Hurricane Iniki that broke open lots of chicken coops on the island in 1992. These chickens are confused and start crowing way before the sun every rises. We were staying in a condo with no glass windows, all we had were shutters. This lack of any soundproofing made my first nights sleep difficult. So the next day I picked up some earplugs and slept peacefully for the rest of the vacation. So I found it amusing when I came across this amusing article about a neighborhood chicken who was disturbing the neighbors. "CHARLIE the cockerel went from being in the soup to flavour of the month this week as he was given a free soundproof chicken shed. He also received the backing of several neighbours who branded a campaign to silence him “petty”. The rowdy rooster’s owner, Ozzie Williamson, had been ordered by Ettrick and Lauderdale District Court to build a lightproof shed to stop Charlie waking at dawn and disturbing neighbours. But Ozzie was saved the trouble when he received a call from Hawick-based Porters Porches, who offered to build Charlie a chicken shed complete with soundproofing – for free. " Here are the specs on this soundproofing chicken coop. The shed has high-density foam insulation and 28mm glass panels to dampen the noise, plus a comfy roost inside.